Gibson Super Truck Dual Tip Side Exit Exhaust Systems offer a the Nascar Race Truck look while improving performance and sound significantly. You'll enjoy a deep race rumble from your truck, as well as improved exhaust flow, improved horsepower and acceleration. All of your factory exhaust piping behind your catalytic converter will be replaced with high performance optimally bent Gibson Exhaust pipes. 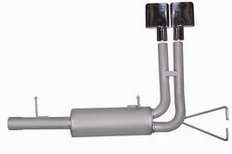 Dual performance exhaust pipes exit the Gibson high flowing performance muffler and are topped off by twin sport truck style rectangular exhaust tips that exit in front of the rear wheel of your truck. If you wanted a sport truck performance look to match the improved engine performance you're going to get, this is the exhaust for you. The part number for this item is 9517 and it fits 1999-2004 Ford F250 F350 SuperDuty 5.4 AND 6.8 (Crew Cab 6 1/2' Bed) models. 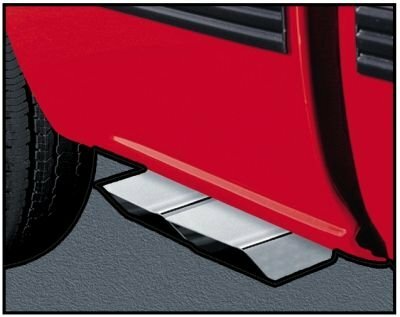 This exhaust features a 3" Diameter and DUAL 6" Rectangular Tips, both exiting in front of the rear wheel.. This is a Cat-Back exhaust, meaning all piping behind the cat is replaced.